Nite Owl Creates: California Easter Pinterest Party! 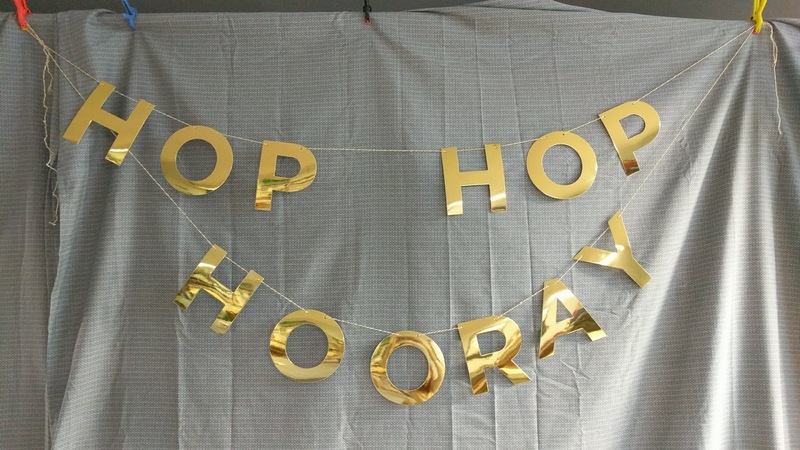 Hip hop hooray for an Easter Pinterest Par-tay! The more I planned and thought about this party, the more excited I got. I found lots of fun crafts for everyone to make and really cute food ideas! Oh, and before I forget, here's the Easter board I made for inspiration for myself and anyone attending the party. Robin came for the first time ever which was so awesome because she is such a sweet lady. She brought these delicious chocolate cupcakes with homemade frosting. The cupcakes were the perfect texture and I loved the colors she put on top. Tony made these pudding cups Easter themed for the party that I found a picture of on Pinterest. 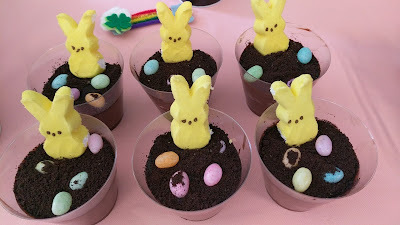 Unfortunately the link took me nowhere and it was a bit more affordable to buy the kit (pudding and Oreos crushed) to make these and then add in our own jelly bean eggs and marshmallow peeps. So that's what we did and I think they turned out so cute! Since people in CA voted to bring more food than crafts, I told myself I'd only provide drinks. Well, the numbers went up, then down, then down again on who was coming and I didn't want there to be just one or two options to pick from for food so I thought, what the heck, and had Tony put these together. Wendy brought a veggie tray, fruit bowl and some dried and seasoned green beans. So interesting, I'd never tried those before. I think I like them but need to eat a few more to be sure. New to me! 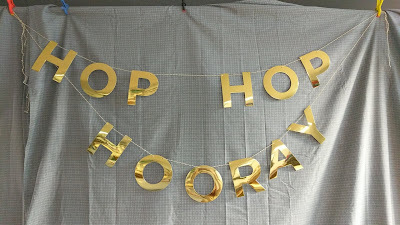 Thanks to Target for this fun decor! First craft we made was little Easter bunny flowerpots. That link is kinda horrible because it doesn't lead you to any actual instructions on how to make this. I'm sure there are links on Pinterest that do but I was able to figure it out alright without having exact directions. These ended up turning out adorable! Just some clay pots, fill with soil about 3/4 up inside the pot, use a big cottonball for the body of the bunny and a small one for the tail, felt cut for the feet and artificial flowers. Simple and fun! I had some extra wood fences from Darice that they sent me last October to make Halloween fences with. With the ones that were left we made spring/Easter themed fences. Oh man, this was so fun to do! This is the one Robin made...I love how she layered her flowers and added lots of lady bugs. I love the wild look of the dark green grass. Wendy decorated this fence and I was loving the bright colors she used on the fence slats and switched up the colors. Some bird washi tape fits in nicely and she used the grass to cover both layers of the bottom section of the fence. Plus...that owl! Here is how mine turned out. I felt like keeping this one simple but I may add something in the future. The pink ladybug was a nice touch to go along with the dragonflies along the top of the fence. I used Gold paint from Deco Art and it was so vibrant. After a brief break to eat some food, we got to steppin' because it was already 2:30 at this point and I try to wrap things up at the 2-hour mark. 30 minutes left to do 2 more crafts! I found Easter Egg Bath Bombs on Pinterest and wanted to make these so much. I have had these plastic eggs for a few years and it was nice to finally use most of them up. I was expecting more people so Tony doubled the recipe for me. Normally it would make 8 eggs but we actually ended up getting 18 out of the mix. We did 4 colors - pink, purple, green and blue. It was fun to mix the colors together to create a rainbow effect as I did on the right side of the egg shell here. Since I dont take baths, I made these for my niece and nephews in UT. Wish I could have made them for everyone but there were 3 of us making these so we all got to take about 6 or so home. We had this craft last and this is one that Robin brought. I was so impressed that she brought food and a craft! Usually I just have people bring one or the other but hey, I wont be mad if someone wants to contribute both. Just Wendy and I painted eggs, Robin had to head out and I wish I had gotten mine and Wendy's eggs next to each other but forgot! We did add magnets to the back and they are really lightweight eggs so they will hang nicely on the fridge and not slide around. I used a mix of paints I had including some great ones from Plaid Crafts. It was fun trying different paints with these! Once again, thank you soo much to those that were able to come and those that had to miss out due to circumstances, I really hope to see you guys at the next one. Will be announcing the theme and date for April in the next couple weeks. Thanks for reading and leave me a comment with what your favorite craft was that we did! Paint Night with Plaid Crafts! St Patrick's Theme Pinterest Party!